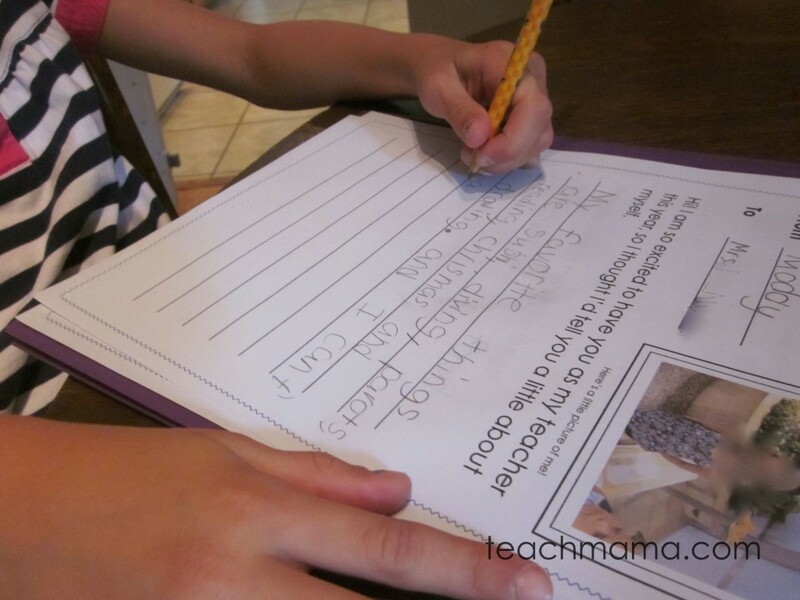 meeting new teachers: hello, teacher notes! Today we spent a few minutes doing one of our favorite back-to-school activities–one that gives my kiddos a chance to say a little ‘hello’ to their teachers even before they meet them at the Open House. A while after breakfast and after we all enjoyed some much-needed end-of-summer downtime, I printed out Hello, Teacher Notes for Maddy, Owen, and Cora. It was a gorgeous morning, so I thought it would be perfect for a slow walk up to the school to deliver the notes before we crammed in a front-yard, clean-out-the-fridge picnic and an afternoon pool trip. We sat down at the dining room table, sharpened pencils in hand, and we got rolling. Owen and Cora used the same template, the Hello Teacher Note. 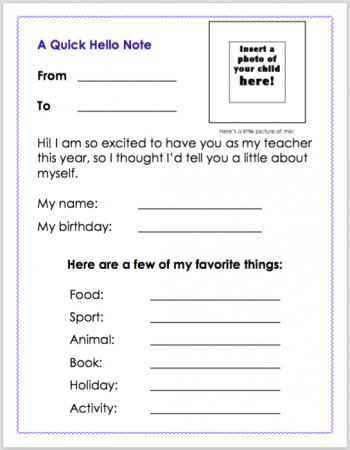 It has a spot for kiddos to add a tiny picture of themselves and to write their name and birthday (because kids need to know their birthdates!). 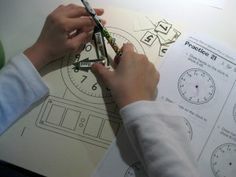 The Hello Teacher Note also have spaces for kids to write their favorite food, sport, animal, book, holiday, and activity. As Owen wrote, we talked through the spelling of the words he didn’t know. I’d say something along the lines of, Okay, Owen, what’s your favorite food? He’d think for a minute or so and give me his answer, and I’d say, ‘Hot dogs’ are your favorite food. What sound do you hear at the beginning of ‘hot dog’? (He’d tell me.) You got it. And what letter makes the ‘hhhh’ sound? Right–‘h’. So we spell ‘hot dog’ with an ‘h’, then an ‘o’, and what sound do you hear at the end of ‘hot’? Yes, my friend. ‘Tttt’ and ‘t’ makes the ‘tttt’ sound. Hot is spelled, ‘h-o-t’. We walked through the Hello Teacher Note with this kind of shared writing, with me writing the words on a sheet above his and giving him the difficult sounds. My focus was to have him isolate and identify the beginning and ending sounds of the words. With Cora’s note, I really just had her write her name, and I wrote as she dictated. She was happy to be able to write her name on her own while we talked about her favorites. I really was glad that she has reached a point where she’s comfortable–and confident–writing her name. Woo-hoo! 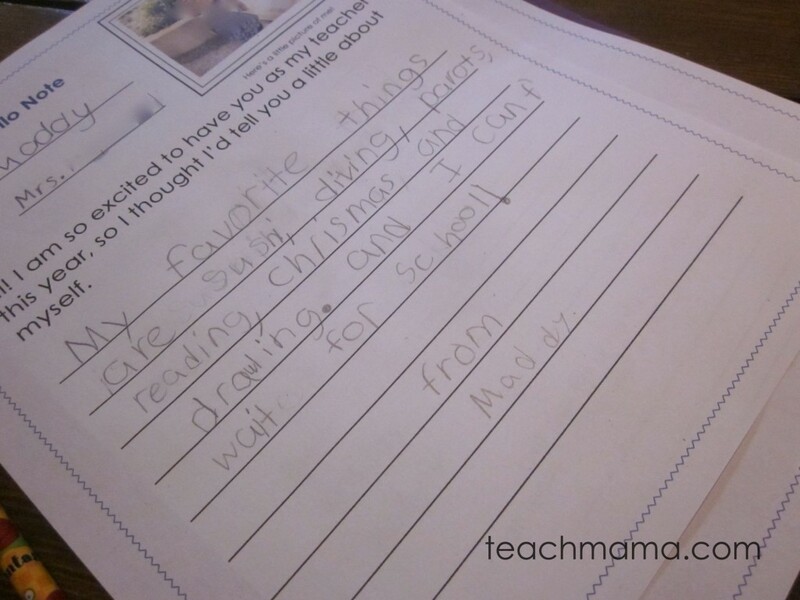 Maddy’s finished Hello Teacher Note–my soon-to-be second grader! I made Maddy’s note a little bit different, since she’s heading to grade two–the bigger leagues. I wanted Maddy to have more ownership of the note and to respect the fact that she is becoming a stronger writer and more creative thinker. My favorite things are [favorite food], [favorite sport], [favorite animal], and [favorite holiday]. I am excited for school to start! She used the fill-in’s on Owen and Cora’s notes as a guide, which was fine with me. I didn’t have her do a rough draft and a final, but I did have her re-check the spelling of some of her words before she put it into an envelope. And really, she didn’t stretch her brain like I’d hoped, but she did write the note without complaint, which really, is all I can ask for some days. 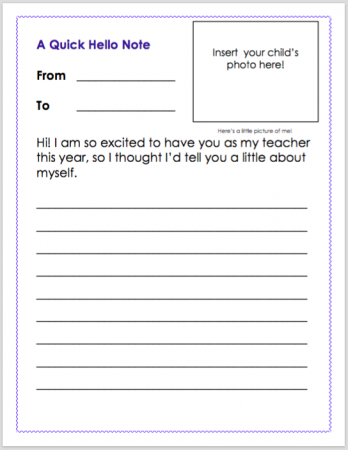 Cora mails her Hello Teacher Note to her new teacher–exciting! 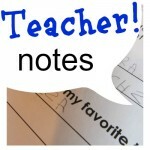 When everyone was finished, they folded their notes and put them in envelopes, writing the teacher’s name on the front. I wrote the address to Cora’s preschool on her envelope, added a stamp, and she sent it on its way. 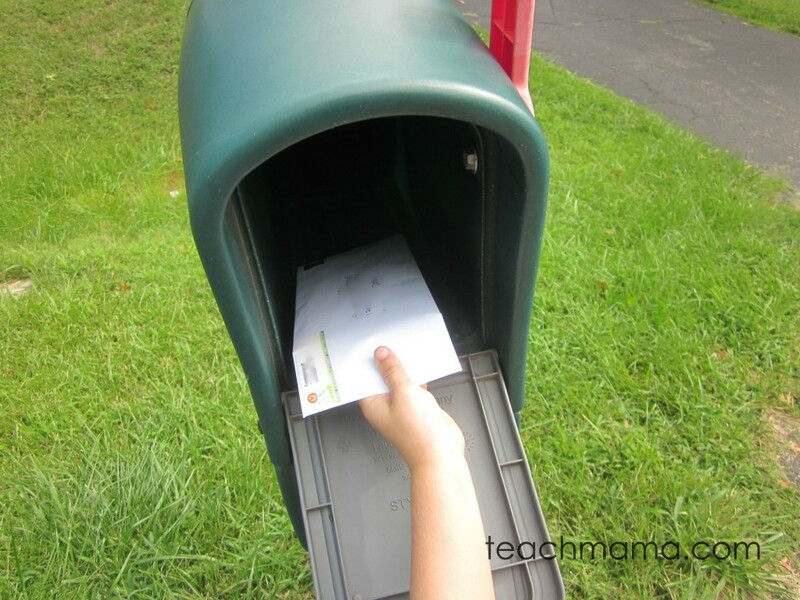 We walked up to the school to put Maddy and Owen’s notes in their teachers’ mailboxes, and we headed back to the homefront for one of our last lazy days of summer. And that’s it–a little bit of sneaky learning, happy back-to-school style! Do you want the notes to download for yourself? Just want to say that I thoroughly enjoy your blog/site and look forward to reading each and every one of them. As a fellow reading specialist and mom, I admire what you do with your kiddos. I just wish I has the same patience you seem to have! :). Keep up the great work! I love all of the ideas you have on here, but most of the time my 3-year-old won’t participate with me. He has autism but is high-functioning. 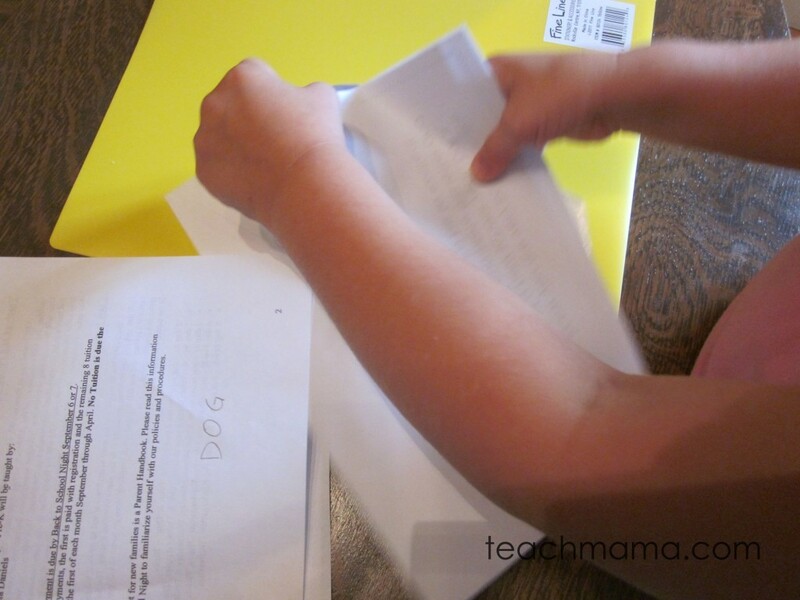 Do you have ideas for getting him to try writing with me? He already knows his letters, he just won’t do any activities with them. Thanks for this great blog! I totally know what you mean–it’s hard to get kids interested/ engaged. Have you tried playing on his interests? Does he like cars/trains/dinos/ sports? If so, you can try using this: http://teachmama.com/2009/04/follow-path-game.html as a template and add the letters of his name (or something) and have him help decorate it. 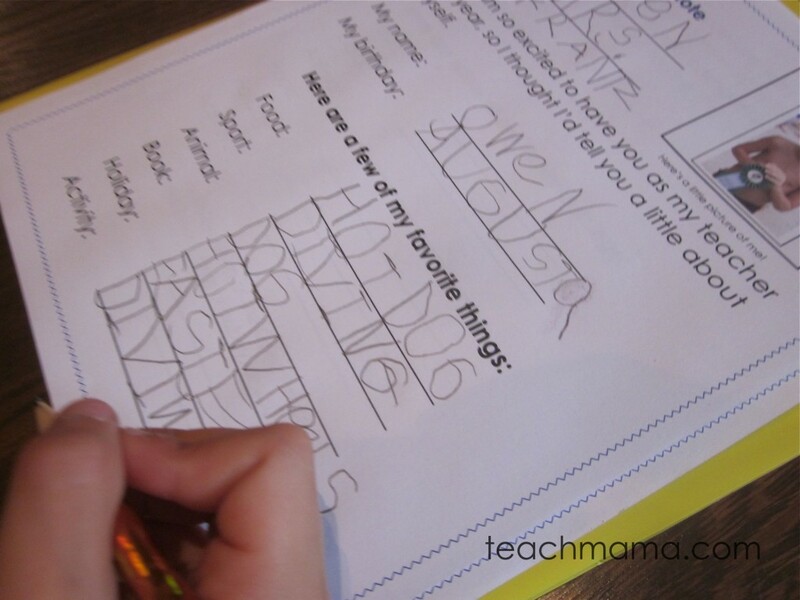 Or try the write around the room game, or silly ways of writing letters..anything from spelling (http://teachmama.com/category/spelling ) or writing or games can be adapted for letter-writing. 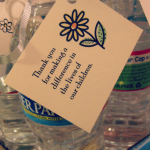 This is such a cute idea, and as a former teacher, I appreciate that you encourage your kids to do thoughtful things for their teachers (saw the water bottle notes as well). One question: how do you organize your space to contain all of these great activities, supplies, etc? Do you have a post that shows photos of how you organize it all? I doubt I could ever recreate it given that I’m not very organized but it would be fun to live vicariously through someone who (I assume) has a structured set up. 😉 As in, how do you store all of the recyclables, materials like letter stamps, etc…Thanks! 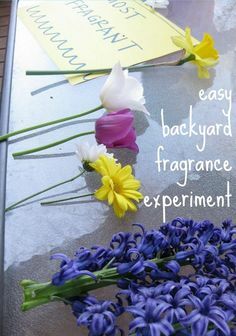 Jenn–SUPER idea for a post. I have shared a video on we teach : http://weteachgroup.com in the video section, but I’ll totally write something up along these lines. THANKS for the idea, my friend! is there a trick to printing this? It won’t print anything but a few words and scribbles for me. The a couple of weeks ago made me think about the teachers Ive had over the years. Though Ive had a few really good ones I think the best would have to be Miss Morelock my third grade teacher at Mt. Olive Elementary School..I dont remember a whole lot about that year except that Miss Morelock was young and still smiled a lot compared to the other teachers. She had long red hair and wore green more than any person Ive ever known before or since. She loved my handwriting skills and told me I wrote .